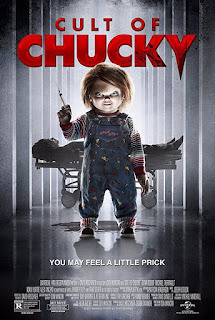 If you've been with us from early on then you'll know that I covered this film's predecessor, Curse of Chucky and was blown away by the franchise's return to being actual horror films. I'm not sure why but when I saw that they made yet another Chucky (do we still refer to this as Child's Play?) film then there was some trepidation that Cult would not live up to Curse. Luckily, I was not let down. Cult of Chucky takes us a few years beyond the ending of Curse. We find out that Nica was blamed for the murder of her family but her insistence on the actual murdering being the Chucky doll lands her in a maximum security psych hospital. She is eventually deemed safe enough to be moved to a medium security space by her doctor. At the same time, Andy (from the original Child's Play films) is all grown up but still tortured by his past. He keeps a living Chucky head in a safe believing that this is the best chance to prevent him from doing anymore harm. Unfortunately for both of them, Chucky learned a spell from VoodooForDummies.Com (yes, that's a quote) and with the help again of Tiffany, he tries to finish everything he started all while creating a true cult of Chucky. I can't believe that I was blown away again by a Chucky film. It's the perfect mix of meta humor and knowing when and how far they can take a joke. Combine that with some gruesome kills and an overall solid story and this movie is near perfect. Alex Vincent returns as to play the adult version of his childhood role of Andy, Jennifer Tilly is still on board, and Brad Dourif is doing Charles' voice again. What more could you want?